It was July of 1804 when John Garrett III arrived in the section of the Western Reserve destined to become Garrettsville. Col. Garrett had purchased 300 acres in southwestern Nelson Township for $1,313 the year before. For his $4.40 per acre, he obtained wilderness in need of taming and water rights to Silver Creek. In 1804 and 1805, Garrettsville's founder, his family and two friends began to carve a community from the forest. Among their first tasks was construction of an earthen dam and a saw and grist mill on Silver Creek. The few mills in existence in the area at that time were primarily for the use of individual families or single neighborhoods. Early settlers who left their grain to be ground at these mills often reclaimed it unground and ate it boiled throughout the winter. John Garrett's mill was different. It was destined to serve residents within a 20-mile radius, and it did. In 1805, a road was cut from Mantua to Garrettsville. In 1806, the Cleveland-Pittsburgh Road was cut near the mill. Hardy pioneers traveled these roads and paths through the forests from Nelson, Mantua, Hiram, Freedom and Windham to get their grain ground at Garrett's mill. 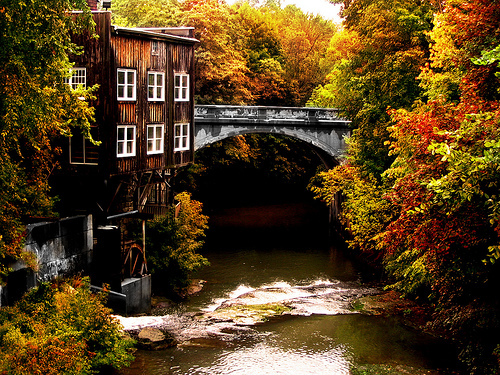 As time went on, a settlement grew up around the mill. Churches, stores and one~room schools were built, and the railroad came to town. Over time the little community had growing pains. One of the pains was the mud shoppers visiting Garrett's mill had to walk through to get to other stores. To overcome some of these problems, residents of the southwest corner of Nelson in 1864 petitioned the Commissioners of Portage County to permit the incorporation of a one-mile square area "to be designated by the name of Garrettsville." On September 1, 1864, at a shoe shop, 62 voters elected a mayor, recorder and five trustees. Nine days later, at the first meeting of the incorporated village of Garrettsville, the building of a plank walk from the depot to the east side of town was unanimously approved. By that time or soon after, Garrettsville had become the home of a grist mill, carriage factories, distillery, tannery, woolen mill, chair and table factory. two or three foundries, a saw mill which also turned out rakes, a pail factory and, because flax was an important crop, a linseed oil factory. About 1820, the store which was to become The Root Store, the oldest department store in Portage County, was founded near the intersection of what today is S.R. 82 and 88. And in 1830, a tin shop which added hardware in 1854 was established near the intersection of Center Street and Maple Avenue. That today is Irwin Hardware located across Main Street from Hopkins Old Water mill, once Garrett's mill. A Farmers Bank, founded in 1871, remains today as Portage National Bank. Prior to this date, the meat market known today as Main Street Market was begun. Pelsue Drug is a descendant of Morris Brothers, a pharmacy established in 1875. That was also the year when J. H. Bogrand Dry Goods and Clothing, destined to become Menough's, was founded. The business was then purchased in 1896 by R. B. Waters and Sons. The forerunner of Lansinger Jewelry began in 1886, the same year telephones were introduced to the community and the opera house was built at a cost of $15,000. By 1899, Garrettsville was considered the largest maple syrup center in the world. The man primarily responsible, Arthur Crane, had his cannery on Windham Street. It was his son who founded Crane Candies and who developed the formula for Lifesavers candy, and his grandson, Hart Crane, who wrote poems now studied on college campuses throughout the country. As the business district developed, so too did churches, schools, public services and service-oriented and social organizations. Major industry arrived in 1923 in the form of Polson Rubber, which bought out the older McWade Rubber, perhaps best remembered for its winning baseball teams. Today, the little settlement which grew around a mill lives on, still a shopping center for a tri-county area, still rural in the midst of rapidly growing northeastern Ohio, still a good place to visit and a great place to live.